In conjunction with the 25th World Gas Conference in Kuala Lumpur, the event management company for this conference is holding another event, the Kuala Lumpur International Music and Light Festival 2012 daily at the Esplanade, Suria KLCC, during the duration of the World Gas Conference from the 4th - 8th of June, 2012. 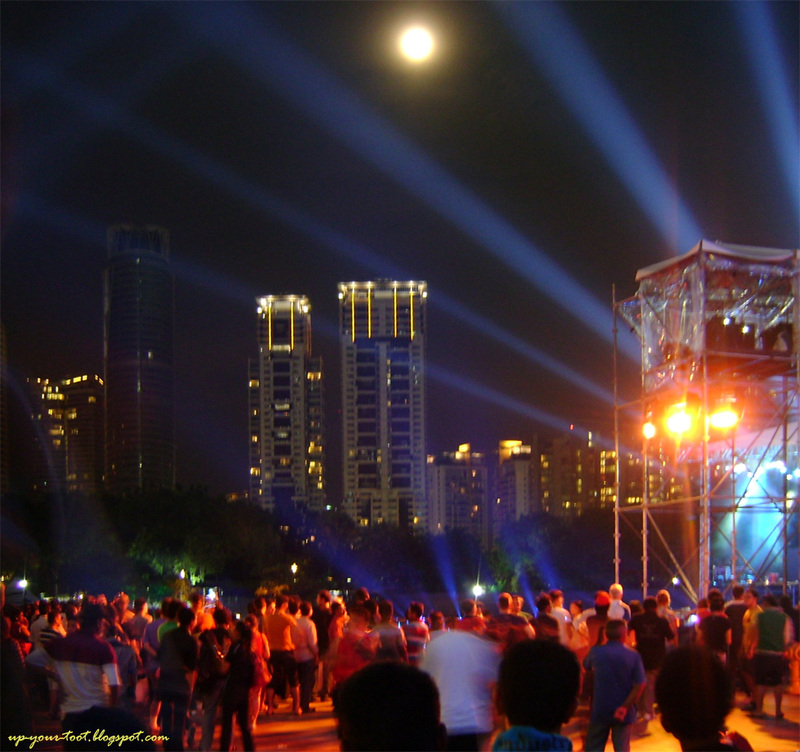 The 2012 KL International Music and Light Festival, which carries the theme "World Peace, World Harmony, World Unity", starts daily at 8pm until 10.30pm. 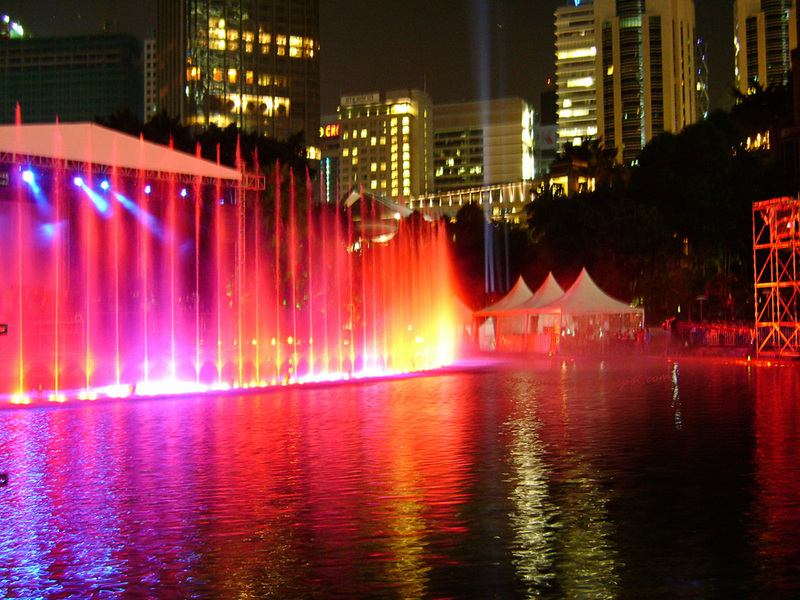 Bright colourful dancing fountains was one of the highlight of the KL International Music and Light Festival 2012. 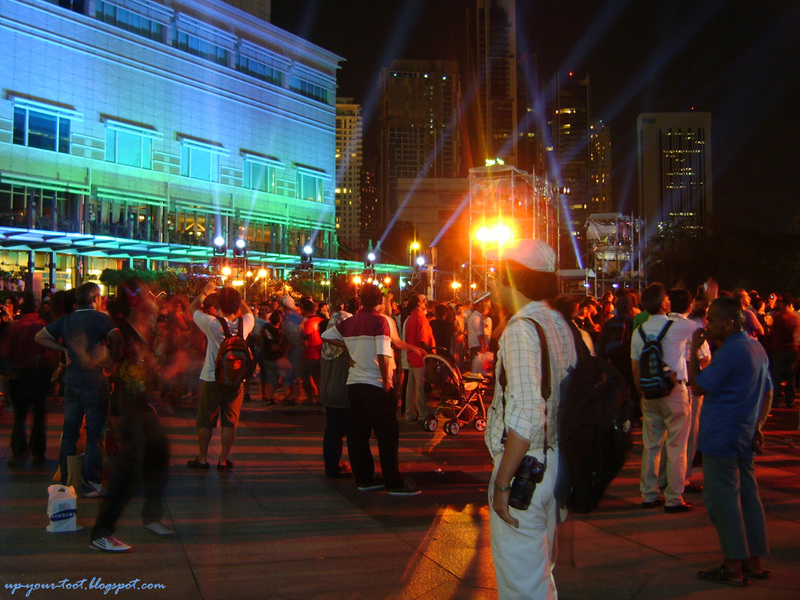 The whole Esplanade of Suria KLCC was bathed in psychedelic lights as well as a huge crowd. On the first day of the event, the sight and sound of a fireworks display that was visible from Ampang led us to finding out about the event. 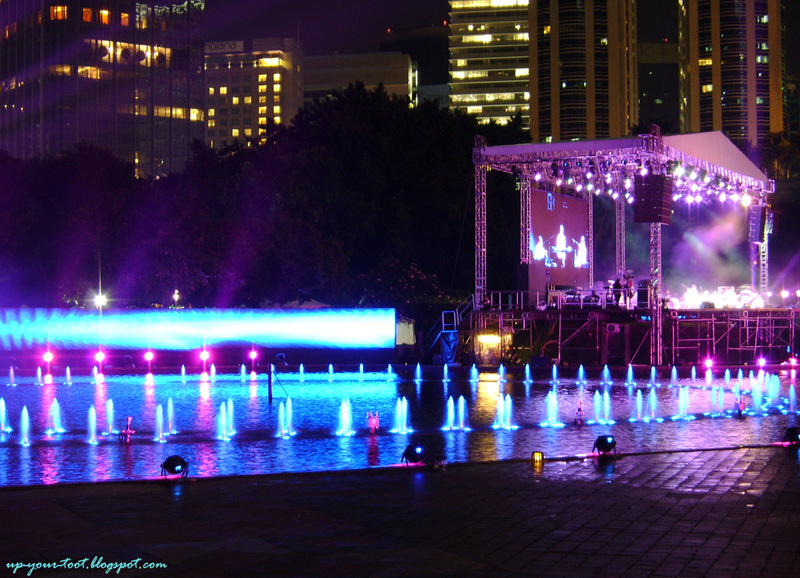 According to the event website, this festival will have a dazzling showcase of the largest light installation, dancing fountains, water screen, pyrotechnics and multimedia lasers displays, video mapping - projecting advertisements and branding on Suria KLCC. This festival will also bring together international and local musicians creating music on a single platform, whilst at the same time, promoting the theme. The main stage where the performers are staged. A dancing rainbow curtain of water. People grooving away to the beat of the music. 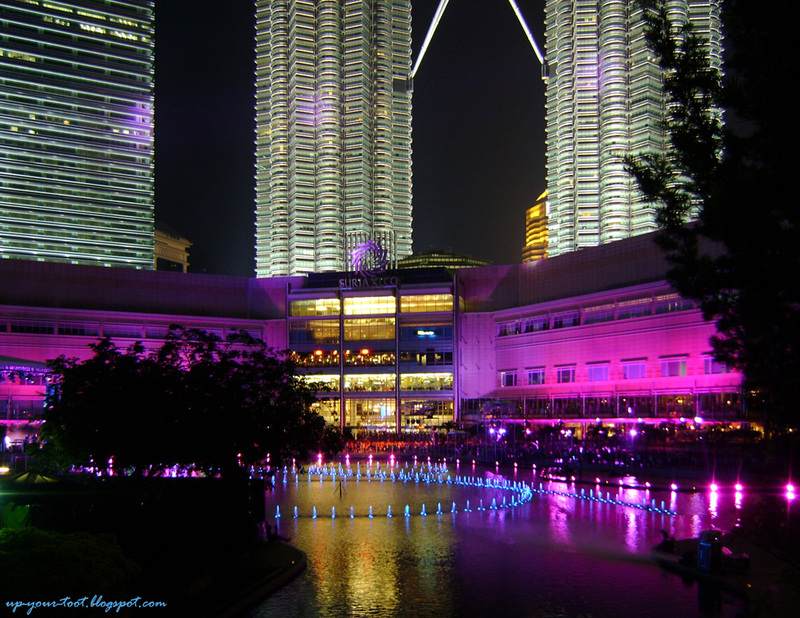 The walls of Suria KLCC becomes a projection screen for the video mapping, projecting shows. Different performers/musical acts were listed for each of the night that the show is on. On the night that we went, a local act, Akasha was there for the night's performance. 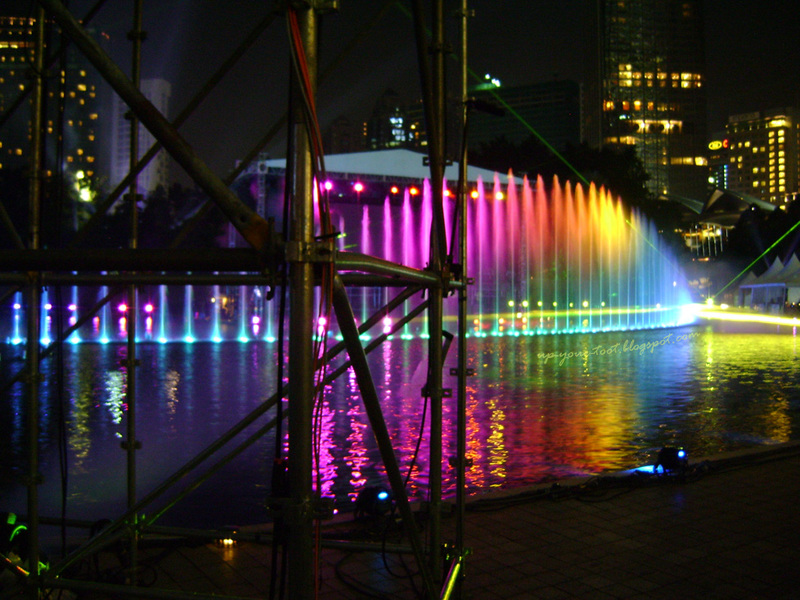 The dancing fountains and laser displays were spectacular, plus the video mapping shows too captivated the audience that were present. 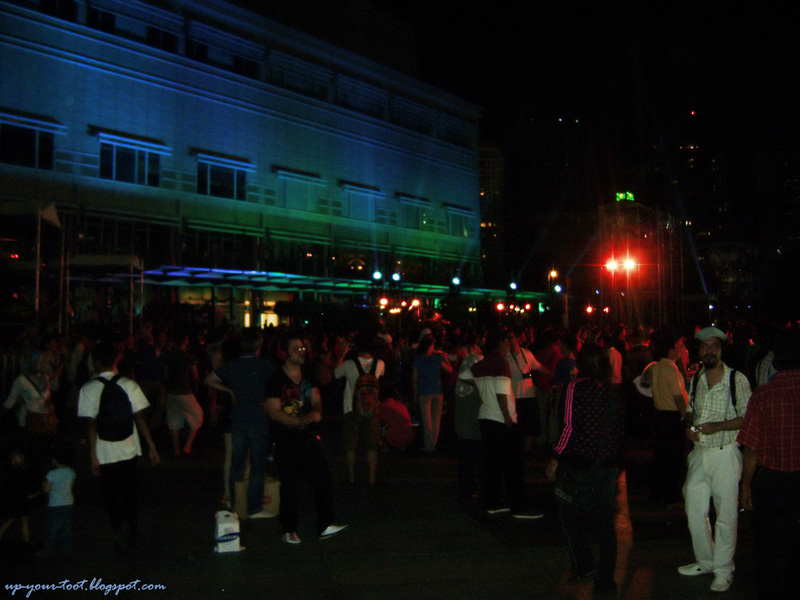 Many were seen dancing and grooving away with the music through the night. So if you have some time this Friday evening, do go and catch the last night of the show. An open air, moonlit dance club?? 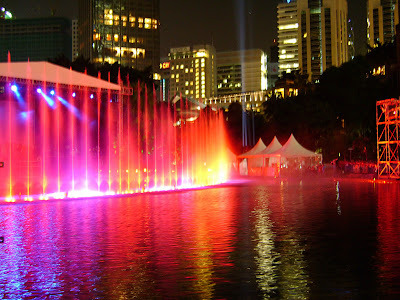 No, its the KL International Music and Light Festival 2012. Even after the performance had ended, the guy beside the Samsung shopping bag was still grooving to his own music. Lama tak pergi KLCC. So colourful now eh. For the festival yes, tapi hari biasa gelap juga. Though nowadays quite a lot of people visit the park at night. Ada yang jogging pukul 9 malam! Hah, when you are back here bolehler bawa family picnic kat tepi tasik. Wow, so beautiful! I just miss it. The crowd was unbelievable, but the humid weather made it quite uncomfortable for me. full album music dia dah keluar ke? need to hear again.